A Slice of Smith Life: "Parade Around the Our Father" Catholic Kidz Camp (VBS) Has Begun! "Parade Around the Our Father" Catholic Kidz Camp (VBS) Has Begun! This week I'm very excited to be a part of our Church's Catholic Kidz Camp (also more well known as VBS) and lead 10 rising 1st graders through Parade Around the Our Father! For the past 2 years our parish has used Growing with the Saints Catholic VBS programs and kids and adults have loved the programs so much! I love that they are authentically Catholic programs made by Catholics for Catholics! 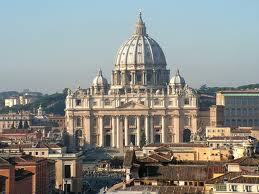 In June 2012, we used Vatican Express and you can read all about our fun week HERE. and you can read about our faith-filled week HERE. "Growing with the Saints, Inc. is committed to handing down the Catholic Faith received from Jesus and the apostles. The Holy Spirit is our unseen ever present guide as we prayerfully impart the Catholic faith with its rich tradition. We utilize Sacred Scripture, tradition, and the lives of the saints to accomplish our purpose. We are dedicated to inspire young children to fall in love with Jesus and his Church. GWTS is committed to preserving the memory of the holy saints and calling children to “holiness” by imitating the lives of the saints, our true faith heroes and heroines." HERE are some reviews from others that have used Growing with the Saints programs and loved them! If you would like to see an overview of what we will be exploring this week check out this link HERE! Day 1 of Catholic Kidz Camp this year was quite a success and fun as we learned a little about the "Flying Friar". Stay tuned as I will be reviewing our parade week and posting more about the fun at the end of the week! I want to thank our Director of Children's Ministry, Ms. Anne, for ordering and organizing such a wonderful and faith-filled program!